From the bottomless buffets to the ubiquitous entertainment spectacles to the late-night, high-octane club circuit, Las Vegas is known as a place where overindulgence is not only acceptable it’s expected. So it’s only natural that the cocktail game in America’s adult playground would follow suit. The most recent addition to Vegas-style showboat mixology can be found at concession stands in the brand-new T-Mobile Arena. Long-time Vegas mixologist Tony Abou-Ganim has created a signature drink called the Atomic Fizz specifically for the venue. This draft cocktail combines Grey Goose Le Citron, Aperol, agave nectar, prickly pear puree, lemon and sparkling water. But that’s just the tip of the alcoholic iceberg. Here is a list of where you can find the most extravagant cocktails and limited-edition spirits in Sin City. Just the mention of Donald Trump’s name elicits a variety of passionate responses from just about everyone these days. 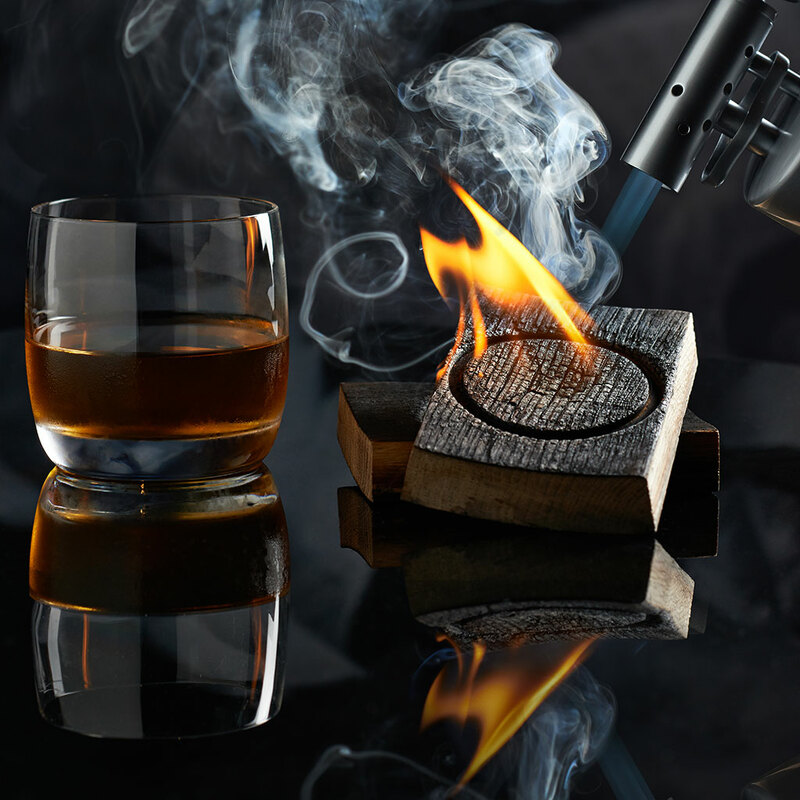 But at DJT at the Trump International Hotel, an innovative take on the hot toddy, The Roasted Todd, is probably the least controversial thing the Trump brand has ever been attached to. Yes, summer is approaching, but the AC is always cranked up in Vegas, so you can enjoy this mix of Angel’s Envy bourbon, Earl Grey tea, and charred rosemary sprigs all year long. Related: Why Can Cocktail Bars Make Perfectly Clear Ice and I Can't? If you have some extra money to burn, make your way to the Talon Club in The Cosmopolitan—a tucked away lounge where you can splurge on a drink called the Secretariat. For 250 bucks, this blend of Courvoisier L’Essence, Grand Marnier Cinquantenaire, and five-spice syrup might be the perfect refreshment to help you celebrate that hot streak at the tables (or more likely, help you forget about the rent money you just lost). Seasonal produce and the farm-to-table concept are highlights on the food menu and the cocktail menu at this restaurant located in the Bellagio. The Cranberry Desert Sage serves two in a porthole infusion jar that marries cranberry, persimmon, kumquat, and desert sage syrup with vodka and Maraschino liqueur. There are several other “farmer’s market” cocktails at the restaurant as well, including the Apple Rocks which plops an apple chip frozen inside an ice cube in Michter’s Rye, pear liqueur, cider and maple syrup. For something a bit more traditional, but still unconventional, try a pre-bottled martini or Negroni. You know how those nights go. You hit the club, you’re getting a little bored with bottle service, DJ Pauly D isn’t on for another hour… What else is there to do but order the $10,000 Ono cocktail at Wynn’s XS Nightclub? It’s not that complicated a drink – a little champagne, some super rare Remy Martin Louis XVIII Black Pearl, a few other ingredients… and a set of silver cufflinks and white gold necklace for you to take home and remember this night forever. If you prefer straight whiskey to fancy cocktails, several Vegas casinos offer exclusive, single-barrel bourbons that cannot be found anywhere else. The Mirage has Jack Daniel’s Single Barrel Mirage Personal Selection on tap, which is supposed to be an oakier version of regular old Jack. At the Monte Carlo, you can find Knob Creek Single Barrel Reserve, drawn from a hand-selected barrel of this small-batch member of the Jim Beam family. And the MGM Grand has its Woodford Reserve Double Oaked Single Barrel-by-the-Barrel program, for which resort staff traveled to Kentucky to personally hand-select a special barrel.